It should be emphasised that this is only a model, not a precise prediction. There are many possible patterns for drawing up constituencies that will be consistent with the new rules, and this is but one solution. The political parties have no doubt done similar work. But the final word will go to the Boundary Commission working in each of the component nations of the United Kingdom – and no doubt the result will be different in significant ways from any other model set of boundaries. The authors of this work on boundaries hope that it will raise public awareness of the issues involved, and encourage a maximum of informed public participation once the Boundary Commissions invite consultation on their proposals. There is a hierarchy of four types of decision used in the model. The first two are unavoidable – they are established by law and by the publicly stated policy of the Boundary Commissions. It is possible to draw completely solid and unavoidable conclusions from these facts – for instance, a county such as Dorset with 575,449 electors (i.e. 7.57 times the standard constituency size) cannot possibly be allocated a whole number of constituencies under the new rules. There must be at least one constituency containing parts of Dorset and parts of another county. This specifies that there must be 600 seats (not 599 or 601), and establishes 4 exceptions from the main rule on equal size (2 seats for the Isle of Wight and 2 Scottish island groups left alone). The 596 ‘normal’ seats are distributed to the 4 nations according to a formula, again set in law, so we know that Northern Ireland has 16 seats, Wales has 30, Scotland has 52 (50 normal plus 2 special island seats) and England has 502 (500 normal plus the 2 on the Isle of Wight). 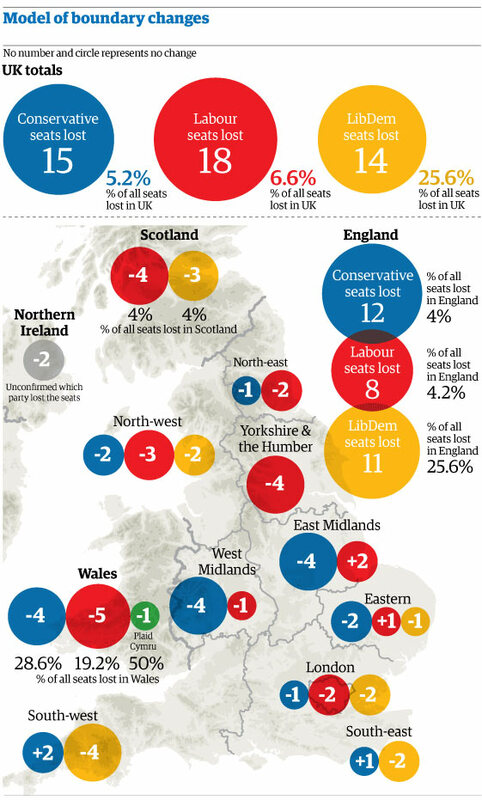 All the 596 normal seats must be within 5% of the average size, as measured by registered electorate in December 2010. The average size is 76,641. Therefore the legal minimum is 72,810 and the legal maximum is 80,473. 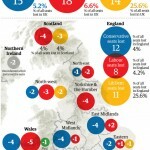 The Boundary Commission for England (BCE) has decided as a matter of policy that it will allocate whole numbers of seats to each region of England, and what numbers it will give to each. Therefore we can say confidently that London will drop from 73 to 68 seats. The BCE has also said it will split local authority wards between constituencies as little as possible. The Boundary Commission for Scotland (BCS) has said that it wants to produce as few constituencies that mix parts of different local authorities as it can. The BCS has for technical reasons the most difficult task of any of the four Commissions. The law also sets out a number of ‘rules’ for redistribution which are subsidiary to the overall rules about the permitted size of constituencies and their distribution to the nations of the UK. These cover desirable qualities of parliamentary constituencies – having regard to local government boundaries where possible, geography (‘the size, shape and accessibility’ of a seat), local ties, and avoiding unnecessary disruption. The text of the Act is available at here. Based on knowledge of past principles and decisions of Boundary Commissions, I believe they will tend for instance to give a high priority to county boundaries in England where they can (it is not going to be possible in many areas). They will also have a bias towards ‘no change’ – if a whole county or current seat can be left alone, it will be. They will also tend to avoid splitting smaller towns unless they have to. They will probably try to avoid ‘orphan’ wards, i.e. small sections of one town or county finding themselves in a seat completely dominated by another area. They will probably have some reference to previous sets of boundaries that existed – for instance where a county gained a seat in the boundary changes of 2010 but now needs to lose one, the new seat will be most at risk from the chop. I have assumed that the BCE will also try to ensure that its constituencies that cross county boundaries will prefer to cross the county line in areas where there are significant cross-border links in terms of economic, social and commuting patterns, and where there is a significant element of both counties included in the cross-border seat. 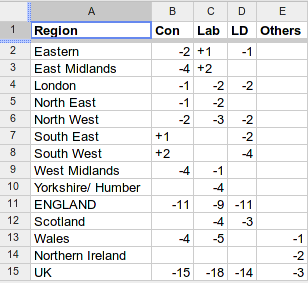 In a couple of cases in the model (Suffolk and Derbyshire) counties that might have been given individual treatment are grouped in the interests of producing better cross-border seats; the BCE may or may not follow this approach. I have also assumed that the Commissions will only use the get-outs for seats with big land areas, or Northern Ireland, if they really have to (they will have regard to the high priority Parliament put on achieving equal numbers and apply this where they can). My model does not involve creating any small seats in Northern Ireland or the Highlands. This is where the most guesswork comes in: there will usually be several sensible alternatives at a local level which fit the statutory and non-statutory rules and the rules of thumb described above. This is particularly the case in the centre of large urban areas, where areas can be combined in many alternative directions, and to some extent in rural seats in the middle of counties. For instance, one can say with a high degree of confidence what the seats at the far end of counties and regions will look like (for instance St Ives and Hereford) but matters are much less certain in inner London. the overall impact the changes would have by party. • Lewis Baston is the main author of the projection, with help from Kevin Larkin.